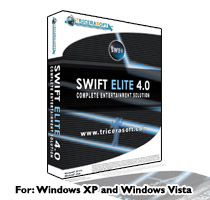 Swift Elite 4.0 is the Complete Entertainment Solution for the PC brought to you by TriceraSoft, the creators of the MP3+G Karaoke Format. Host any Video, Audio, Karaoke or combined show with ease. Bring the Power of Video, VCD, DVD, CD+G, CD-Audio, Karaoke Media Files (Audio+G), Audio files, and Video Sources (Cameras, DV) into one awesome program. Automate your show or take full control , enable your Auto Crossfade and away you go. Host any VJ, DJ, or KJ show at the click of a mouse pointer. Swift Keyboard is the most convinient tool for creating keyboard shortcuts. Taylor Swift Free Screensaver. Photos slideshow. Swift AntiVirus offers comprehensive protection against viruses, worms, Trojans. Swift Security Suite is a free and useful utility package to remove spyware. Qweas is providing links to Swift Elite 4.0 as a courtesy, and makes no representations regarding Swift Elite or any other applications or any information related thereto. Any questions, complaints or claims regarding this application Swift Elite 4.0 must be directed to the appropriate software vendor. You may click the publisher link of Swift Elite on the top of this page to get more details about the vendor.